Is there anyone that Henry Lowther hasn’t played with? He emerged as a trumpet star when British jazz was finding a voice of its own in the turbulent years of the late 1960s when innovative big bands, bop, free improvisation, modes, blues and rock were all part of the melting-pot, and has played a creative role in the jazz scene ever since. Think of all the great British recordings and major jazz events of the past fifty years and Henry will have been there with his distinctive sound as a soloist and section leader. And, perhaps offering the ultimate street cred to those of us who remember the glorious sixties, Henry played at the 1969 Woodstock Festival. Let’s have a look at just a few of the great names he’s been associated with – Manfred Mann, John Mayall, Keef Hartley (at Woodstock where he met Miles Davis), John Dankworth, Mike Westbrook, Mike Gibbs, Stan Tracey, Mike Garrick, Gil Evans, Kenny Wheeler, Charlie Watts, John Surman, and Mark Lockheart amongst many others, without even mentioning his work in the world of classical orchestras. He regularly guested with the Berkshire Youth Jazz Orchestra in the 1980s and Progress regulars will remember his appearance with Simon Spillett’s ‘Miles Standard Time’ package a few years ago. 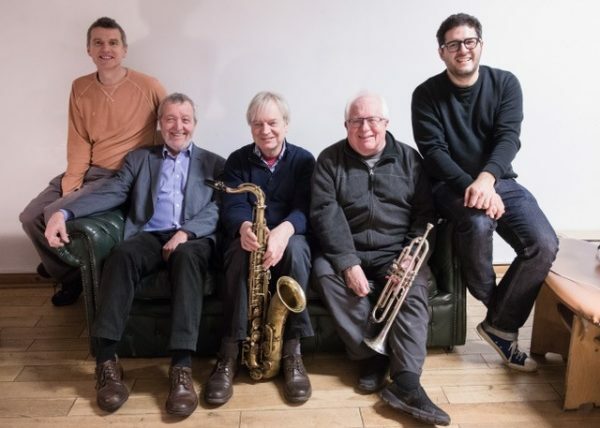 Still Waters came into existence in the 1990’s when Henry joined forces with Dave Green, a bass player whose CV includes Coleman Hawkins, Ben Webster, Roland Kirk, Sonny Rollins, and more recently Scott Hamilton, another ever present force on the British and world jazz scene. They combined to present music of their own choosing when freedom from other commitments gave them the opportunity. No tear-arse tempos nor, by the same token, are there any ten minutes long circular breathing exercises. Instead, it’s clean, relaxed playing. It’s a warm shower on a cool night, or a Pina Colada with lots of ice on a warm summer’s evening. You let the music envelop you – it’s more intoxicating than any cocktail. Henry and Dave are joined in Still Waters by Pete Hurt (Carla Bley Very Big Band, Andy Sheppard), pianist Barry Green (Ingrid Laubrock, Charles McPherson, Brigitte Bereha) and drummer Paul Clarvis (John Dankworth, Herbie Hancock, John Taylor, Kenny Wheeler), three of the most distinctive and creative players on the British jazz scene. Henry is known for his mordant wit and ironic air of the ‘grumpy old man’. He was once a member of the gigantic collective improvising group Centipede. When asked ‘Whatever do you contribute to the music?’ he replied, ‘Ooh, I just practice’. Regardless of whatever else may, or may not, be happening on Friday 12 April, don’t miss the unique sounds of Still Waters at Progress, part of an Arts Council sponsored national tour.